They live a Hannah Montana life. 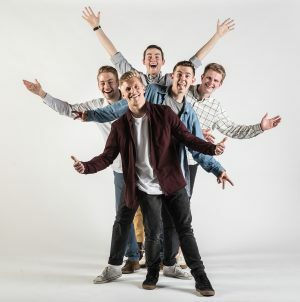 At home in Provo these five 23-year-old returned missionaries are just a bunch of newlyweds and college students living in tiny apartments and making low-budget videos for their Facebook page. But when these friends are in the Philippines, they are boy band-esque celebrities. Young girls chase their van, kissing the windows. Hotel owners hug them. “Police officers would stop traffic to take selfies with us in the middle of the road,” says Sumner S. Mahaffey (’19). They are the Hey Joe Show, after the nickname Filipinos frequently give Americans. They crack jokes, wear ridiculous outfits, dance crazily, pull pranks, and even make music videos. And they’ve garnered over 800,000 Facebook followers and some 50 million video views doing it. But you probably wouldn’t understand much of it. All Hey Joe sketches are done in the Filipino language of Cebuano, or Bisaya, and they don’t provide any subtitles. Says Hey Joe member Davis D. Blount (BA ’16), “It’s kind of a badge of solidarity with Bisaya speakers”—the people they served on their missions. For members of the Hey Joe Show—(from front) Connor Peck, Sumner Mahaffey, Tylan Glines, Jacob Mingus, and Davis Blount—and their Filipino fanbase, the affection is mutual. Photo by Bradley Slade. One would need to learn Bisaya, for instance, to sing along with Hey Joe’s most recent song, “My Morena Girl,” which was the first Bisaya music video to be featured on the Filipino MTV—MYX—and reached no. 3 on the Filipino national chart. The idea for Hey Joe came to the five—Blount, Mahaffey, Jacob T. Mingus (BS ’17), Tylan J. Glines (’16), and Connor Peck (BS ’17)—while they served in the Philippines Cebu Mission. They noticed the lack of family-friendly content in Bisaya, and upon returning home, they recorded their first video and posted it in October 2014. It went viral. Fast. Within days, Filipino news and media stations were calling for interviews. After the success of their first few videos, the group took a leap of faith: they booked their first tour mid-semester in winter 2015. On the way to their first show the next summer, they agreed that an audience of 50 or so would count as a success. But when they entered, they were met with deafening screams. “We had been seeing thousands of likes and comments, but in that moment we realized that each of those represented real people,” says Glines. And the crowds got bigger at every stop. But fame’s not the focus. “Our ultimate goal throughout all of this has been to reach people and keep them laughing,” says Blount. Follow Hey Joe at more.byu.edu/HeyJoe. And check out the music video for Hey Joe’s chart-topping “My Morena Girl” below. In a time when young adults seek help for anxiety and depression like never before, BYU experts offer advice—and hope. A work once lost to the art world is now among the most prized holdings at the BYU Museum of Art. What corner of campus is best for rest? Reader answers, spanning decades and buildings, didn’t disappoint. The high-kicking violin star Lindsey Stirling reflects on her path to becoming queen of YouTube.